Dawn brings the sight of Dream Chaser, Sierra Nevada Corporation’s reusable spacecraft, as it sits on the runway at NASA's Armstrong Flight Research Center (AFRC). Dream Chaser is being prepared to deliver cargo to the International Space Station under NASA’s Commercial Resupply Services 2 (CRS2) contract beginning in 2019. It is currently undergoing testing at Armstrong in preparation for its approach and landing flight later this year. The space shuttle underwent similar testing at the center in the 1970s. Dream Chaser is different in that it is currently being designed to make automated pilotless flights to the station. The engineering test article for Sierra Nevada Corporation’s (SNC) Dream Chaser ‘spaceplane’ flew its long-awaited second free flight test this weekend (Nov 11, 2017) over NASA’s Armstrong Flight Research Center, located at Edwards Air Force Base, CA. The company holds a multi-billion dollar Commercial Resupply Services (CRS-2) program contract with NASA to resupply the International Space Station from 2019-2024, and has its eyes set on eventual crew missions. The problem was traced to a mechanical issue with the specific landing gear, rather than something related to bad software (none of the primary systems that gave the commands that control the flight failed or had any problems). SNC has made significant structural and systems improvements to the test article since, including the composite wings and aeroshells, and invested heavily in maturing the vehicle’s orbital avionics, guidance navigation and control, the flight software, and employed a number of new processes, all of which will be used on the orbital vehicle as well. The advanced orbital Thermal Protection System (TPS) was installed on the vehicle’s skid too, in order to do advanced testing of the actual orbital TPS. 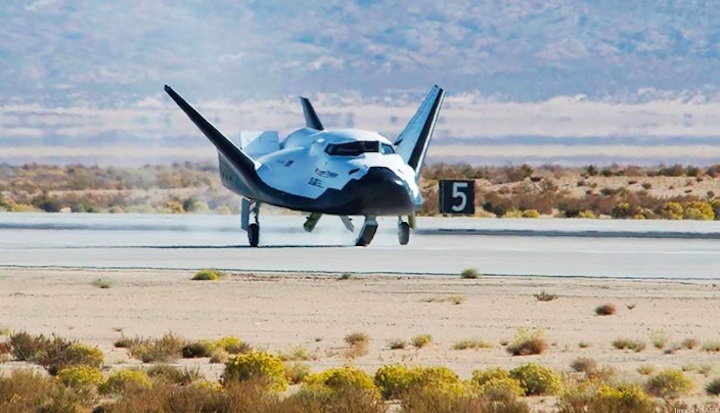 NASA contracted SNC to fly at least six missions with their Dream Chaser under CRS-2, and the company intends to put in a bid for a crew version if NASA opens up more multi-billion dollar commercial crew contracts in the future (currently given to Boeing and SpaceX). Engineers hope to get everything they need out of the Phase Two flight test campaign currently underway, which acts as a bridge between previous work with NASA’s Commercial Crew Program and the latest vehicle currently under development for CRS missions. The company hopes to launch their first operational Dream Chaser cargo mission to the ISS for NASA in the first half of 2019. 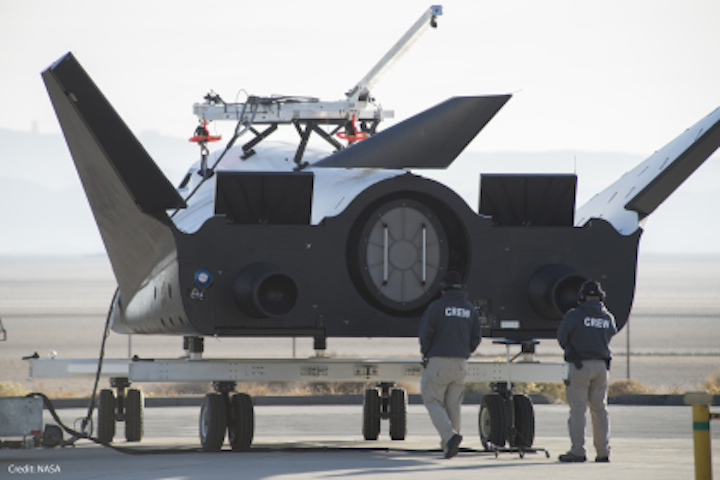 Sierra Nevada Corporation (SNC) conducted a successful free flight of its Dream Chaser spacecraft this weekend. Resembling a very small space shuttle, SNC plans to use it to take cargo to and from the International Space Station (ISS) beginning as early as 2020 as part of NASA’s Commercial Resupply Services 2 (CRS2) contract. Saturday’s test was of a full scale version of the spacecraft that was dropped from a helicopter to descend and land on its own. 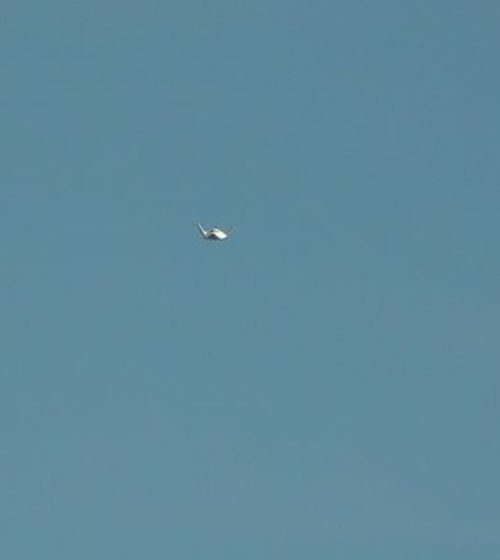 SNC released a video of the test and held a media teleconference this afternoon. 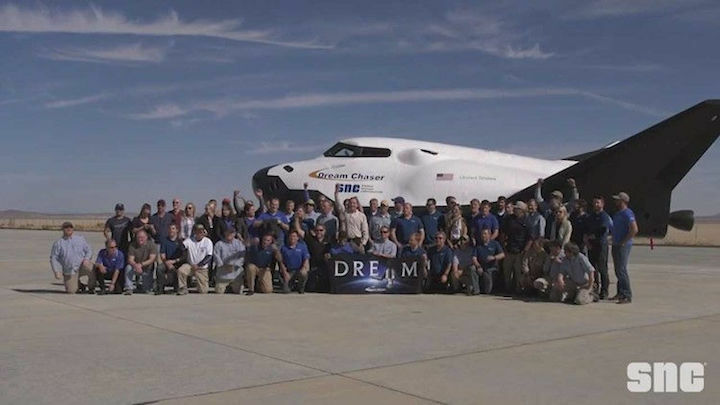 SNC’s Dream Chaser was one of three competitors for NASA’s “commercial crew” program, vying for NASA contracts to develop systems to ferry astronauts to and from the International Space Station (ISS) through public-private partnerships (PPPs). NASA funded several companies, including SNC, through a succession of development activities in the first half of the decade, one of which was the Commercial Crew Integrated Capabilities (CCiCAP) program. Commercial crew was a follow-on to the Commercial Orbital Transportation Services (COTS) or “commercial cargo” program that led to the SpaceX and Orbital ATK uncrewed systems that resupply ISS today — Falcon 9/Dragon and Antares/Cygnus. Orbital ATK’s most recent Cygnus launch took place yesterday. Under these PPPs, the government and the private sector share development costs and NASA guarantees purchasing a certain amount of services, while the companies are expected to find other customers to make the business cases close. During the development phase, NASA pays the companies after they meet specific milestones. If they do not meet a milestone, they are not paid. SNC was competing against Boeing and SpaceX for the commercial crew PPP program in the CCiCAP phase, but in 2014 NASA selected Boeing and SpaceX to continue to the next phase, Commercial Crew Transportation Capability (CCtCAP). SNC challenged the award, but lost. SNC then decided to focus on cargo instead of crew. When NASA held a second competition (CRS2) for commercial cargo services in 2016, SNC won and was added as a third supplier. NASA promised to purchase at least six cargo flights each from SpaceX, Orbital ATK, and SNC. 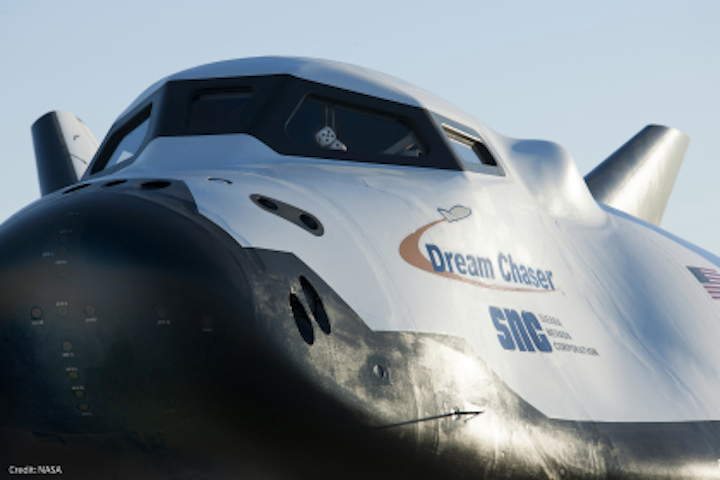 SNC will use uncrewed Dream Chaser vehicles to deliver and return cargo autonomously beginning as early as 2020. The test on Saturday is a step in that direction, although it actually was the final paid milestone in the earlier agreement it had with NASA under CCiCAP. Mark Sirangelo, Corporate Vice President, Sierra Nevada Corporation (SNC) Space Systems. Photo credit: SNC website. The vehicle used on Saturday was the same one used in a series of previous Dream Chase tests where it made captive carry or drop tests. 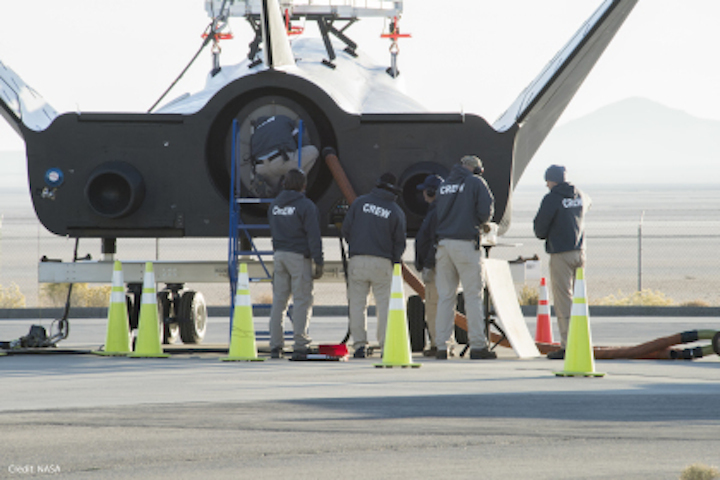 The company is still analyzing the data from the most recent test, but SNC Corporate Vice President for Space Systems Mark Sirangelo said today that everything is looking good and there are no plans to fly this vehicle again. Steve Lindsey, a former NASA astronaut who flew on five space shuttle missions, is now SNC’s Vice President for space exploration systems. At today’s media teleconference, he said that a number of upgrades were made to this vehicle for Saturday’s flight to certify systems for use on the orbital version. That includes thermal protection tiles, flight software, redundant navigation sensors, and guidance and control systems for reentry and landing. He stressed that the vehicle’s flight was completely autonomous, not like a UAV where humans are controlling it. Sirangelo noted that the flight profile included commands for the vehicle to turn left and then right, then return to the centerline during descent. Dream Chaser will go through its Critical Design Review (CDR) next year. Dream Chaser is a lifting body whose design builds on work NASA did through the HL-20 program decades ago. The test on Saturday will inform the final design. The CRS2 contract with NASA is guaranteed for only six flights. 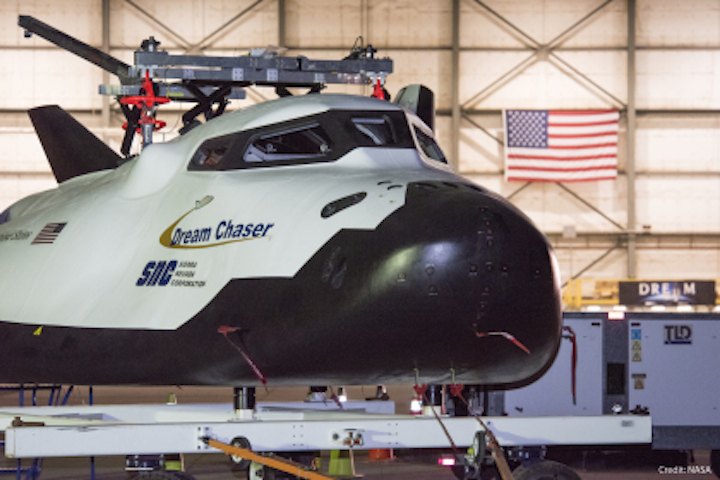 SNC is working to find other customers not only for cargo, but for using Dream Chaser as a space laboratory for 2-4 week periods and launching people into space. The first launch of the laboratory version of the vehicle is expected in 2021, Sirangelo said, pointing out that the company has received an “overwhelming” response to its call for science proposals issued in September at the International Astronautical Congress in Australia. NASA is “the first client,” but SNC has direct or indirect agreements with over 20 space agencies and United Nations Office of Outer Space Affairs, he added. Sirangelo said the company is planning to build two orbital vehicles at the moment and each is designed for at least 15 flights each with a turnaround time of 60 days. SNC already has signed an agreement with the United Launch Alliance (ULA) to send the first Dream Chaser into orbit aboard a ULA Atlas V rocket. He said, however, that Dream Chaser will be able to be launched on a variety of launch vehicles, not only Atlas V, which is due to be phased out in the early 2020s. Dream Chaser also can land in many locations, not only at NASA facilities. SNC is owned by Fatih and Eren Ozmen. Fatih Ozmen was one of three witnesses on the “commercial” panel at the first meeting of the National Space Council last month. The other two companies were SpaceX and Blue Origin. 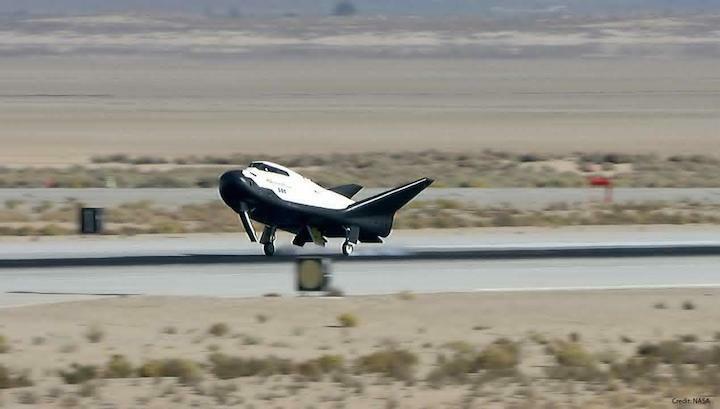 Last weekend, a test version of the Dream Chaser – a reusable spacecraft similar to a shuttle – made a successful free flight and landing in California. More than 400 engineers and employees of the Sierra Nevada Corporation location in Louisville built the autonomous space vehicle. “We’re really excited about the progress we’re making,” systems engineer Kathy Benzin said. Slung below the helicopter on a 200-foot tether, the full-scale atmospheric test version of the Dream Chaser was hoisted to an altitude of 12,324 feet and released. The 30-foot craft then made a completely autonomous descent and landing on an Edwards Air Force Base runway north of Los Angeles. 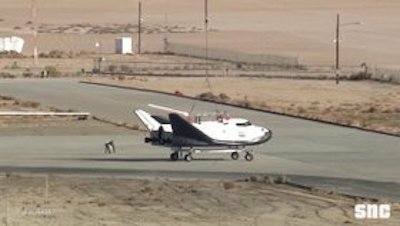 Unlike other spacecraft that splashdown in oceans or touchdown in faraway deserts, the Dream Chaser’s successful test flight proved it can gently land on a runway. Saturday’s 60-second free flight brought Sierra Nevada Corp. another step closer to achieving unmanned cargo flights to and from the International Space Station. Those missions could begin as early as 2020. The Dream Chaser has been in development by Sierra Nevada Corp. for more than 10 years. It has been significantly upgraded since its previous free flight in 2013 which ended with a mishap when its left main landing gear did not deploy properly. 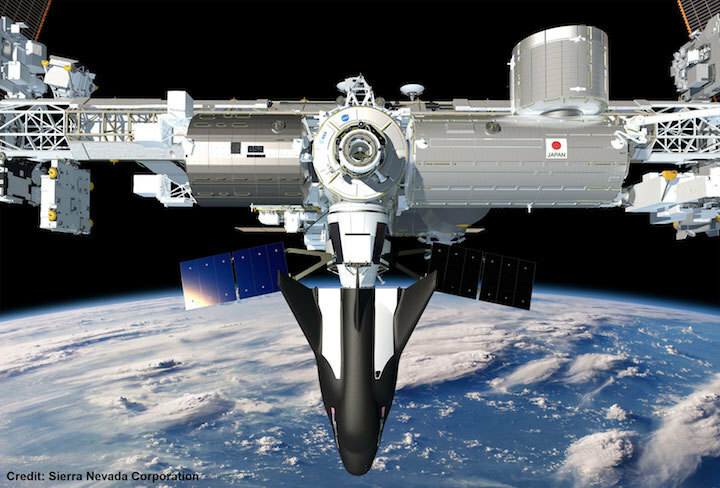 Orbital flights will be made by a space-capable version of the Dream Chaser that will be launched atop a booster rocket. Sierra Nevada has selected Centennial, Colorado-based United Launch Alliance’s Atlas 5 to launch the first two cargo missions, scheduled to blast off from Cape Canaveral, Florida and land at Kennedy Space Center. The Canadian Space Agency (CSA) is organizing a 2-day event - Dream Chaser for Canada. It will take place on December 6 - 7, 2017 at the CSAHeadquarters in Saint-Hubert, Quebec. The purpose of the event is to provide details about the Sierra Nevada Corporation (SNC) Dream Chaser project and establish a forum for discussions between SNC and Canadian companies and academia involved in space-related research and development activities. The objective is to create synergies and partnership opportunities with SNC, allowing Canadian firms and researchers to contribute their unique expertise to space exploration. Participating firms and researchers will have the opportunity to learn about the technical aspects of the Dream Chaser project, meet with the SNC engineering team and discuss mutually beneficial capabilities. Participation in the event is free. However, please note that space is limited and prompt registration is recommended. The event will take place in the CSA's Conference Centre which can accommodate 13 exhibition booths (standard size of 6 by 6 feet). The exhibition space will be available on a first come first served basis, also free of charge. 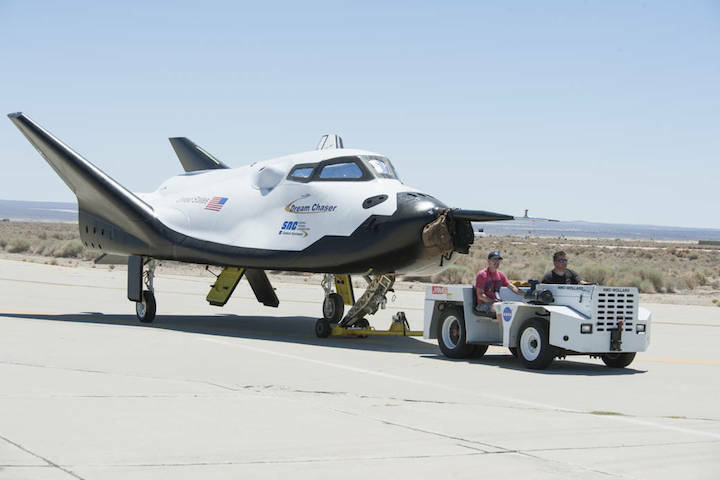 The Dream Chaser® spacecraft is a reusable, multi-mission space utility vehicle. It is capable of providing transportation services to and from low-Earth orbit, where the International Space Station (ISS) resides, and is the only commercial, lifting-body vehicle capable of a runway landing. In January 2016, NASA awarded a cargo contract to SNC under its Commercial Resupply Services (CRS) program for the ISS. 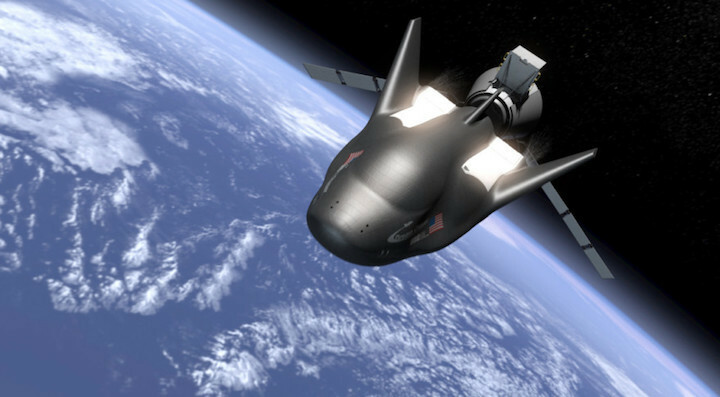 SNC and NASA have since executed a long term public private partnership contract extending cooperation until at least 2024 and providing for the acquisition of a minimum of six Dream Chaser missions by NASA. Please note that on December 7, 2017, a parallel program comprised of various sessions by government officials will take place from 9:00 to 15:00. The CSA, Innovation, Science and Economic Development Canada (ISED), Global Affairs Canada (GAC), National Research Council (NRC), Export Development Canada (EDC) and Business Development Bank of Canada (BDC) will present their organizations' respective policies and programs in support of innovation, business development and export opportunities for Canadian industry. 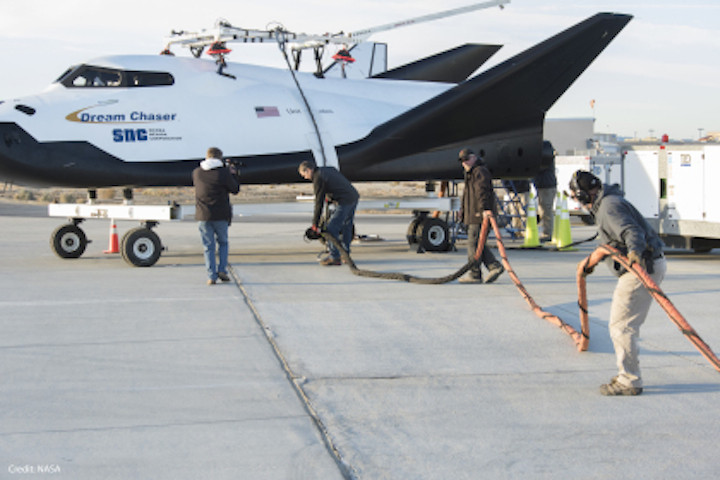 NASA has deemed the Dream Chaser space plane’s flight test last year a success, meaning Sierra Nevada Corp. Space Systems met space agency requirements for funding of the spacecraft’s development. The Louisville-based company tested the self-flying spaceship over California’s Mojave desert in November, dropping the unmanned Dream Chaser by helicopter from 12,234 feet and having the craft’s on-board computers fly it through a couple maneuvers before landing on an Edwards Air Force Base runway. SNC Space Systems’ drop test “validated the spacecraft’s design for a safe and reliable return of cargo services to Earth through a gentle runway landing,” the company said. Achieving the milestone means payment of NASA funds from a program that spurred space companies to develop privately-owned spacecraft capable of flying cargo and research material to and from the International Space Station. Successfully flying Dream Chaser was part of a testing milestone worth $15 million from NASA, according to a 2012 Space Act agreement. SNC Space Systems will receive a total of $212.5 million from NASA if it meets all the agreement milestones. NASA has, under a separate program, contracted SNC Space Systems, Elon Musk’s SpaceX and Dulles, Virginia-based Orbital ATK to handle ISS cargo resupply missions. Dream Chaser is contracted for at least six ISS resupply missions starting in 2020. The craft’s next major milestone is a NASA critical design review this year studying whether it’s ready for orbital flight. Dream Chaser is built at the SNC Space Systems’ suburban manufacturing site northwest of Denver, where the company has grown to have 580 employees. Dream Chaser’s test flight in November lasted about a minute and reached 330 mile-per-hour speeds before the craft touched down smoothly at 191 mph and braked to a stop. Dream Chaser is designed to be launched vertically atop a rocket to reach the ISS or other low-earth orbit destinations and then return by descending back through atmosphere using its wings — either autonomously or, in a future crew version, with a pilot aboard — to land on a runway. Sierra Nevada Corporation (SNC) is a trusted leader in solving the world’s toughest challenges through advanced engineering technologies in Space Systems, Commercial Solutions, and Defense and National Security. Honored as one of the most innovative U.S. companies in space, SNC’s Space Systems business area designs and manufactures advanced spacecraft and satellite solutions, space habitats and environmental systems, propulsion systems, precision space mechanisms and subsystems, and SNC’s celebrated Dream Chaser® spacecraft. With more than 25 years of space heritage working with the U.S. government, commercial customers, and the international market, SNC has participated in more than 450 successful space missions and delivered 4,000+ systems, subsystems and components around the world. 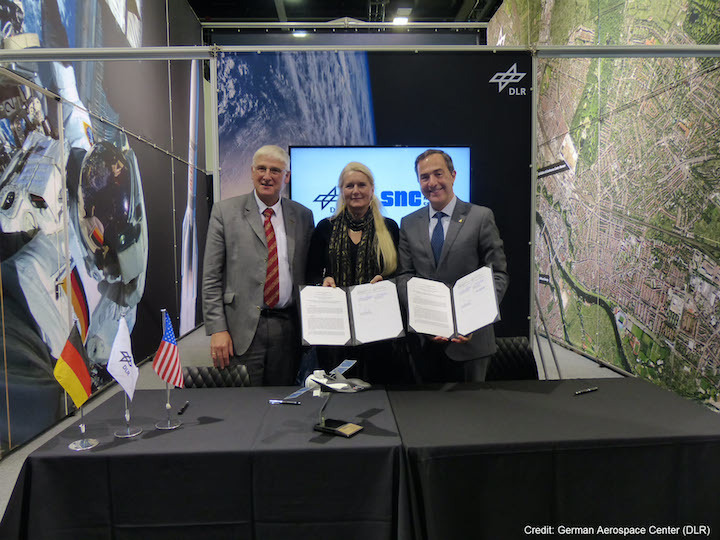 WASHINGTON — NASA has given Sierra Nevada Corporation (SNC) formal approval for the company’s first cargo mission to the International Space Station in late 2020. The mission is the first of six in the company’s Commercial Resupply Services (CRS) 2 contract it won in 2016 to transport cargo to and from the ISS. SNC received a CRS-2 contract along with current CRS providers Orbital ATK and SpaceX. “While we won the contract a couple of years ago, the contract still needed to be validated by a task order,” said Mark Sirangelo, executive vice president of SNC’s Space Systems business area, in a Feb. 7 speech at the Federal Aviation Administration’s Commercial Space Transportation Conference here. That order, he said, is the “biggest step” to date on the program. That flight will be a “full scale, fully operational mission,” he said, even though it will represent the first orbital flight of the Dream Chaser. Orbital ATK and SpaceX, who developed their Cygnus and Dragon spacecraft, respectively, under earlier NASA Space Act Agreements, flew demonstration missions before starting their operational CRS cargo flights. 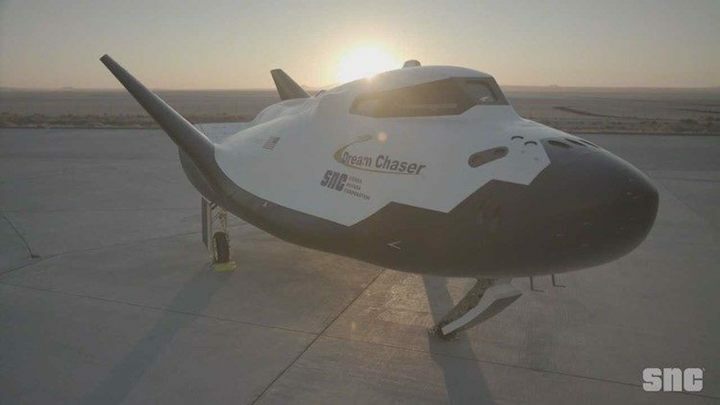 Dream Chaser, which SNC had been developing for NASA’s commercial crew program, will be able to transport up to 5,500 kilograms of cargo to the station. The lifting body vehicle can return up to 2,000 kilograms of cargo from the station, making a runway landing at the Kennedy Space Center’s Shuttle Landing Facility or other airports to enable rapid access to experiments or other time-sensitive cargo after landing. SNC is currently building that first flight vehicle, with hardware under development now in advance of a critical design review planned for the middle of this year. Company officials said earlier reviews identified no “showstoppers” that would prevent hardware production even ahead of that review. “We are now moving forward quite rapidly on our CRS-2 program,” Sirangelo said. A Dream Chaser engineering test article completed a glide flight in November at NASA’s Armstrong Flight Research Center in California. NASA later confirmed that the flight met all the requirements for a milestone in an earlier commercial crew Space Act Agreement with SNC. Just getting to launch day at the Kennedy Space Center in Florida would be a dream come true. 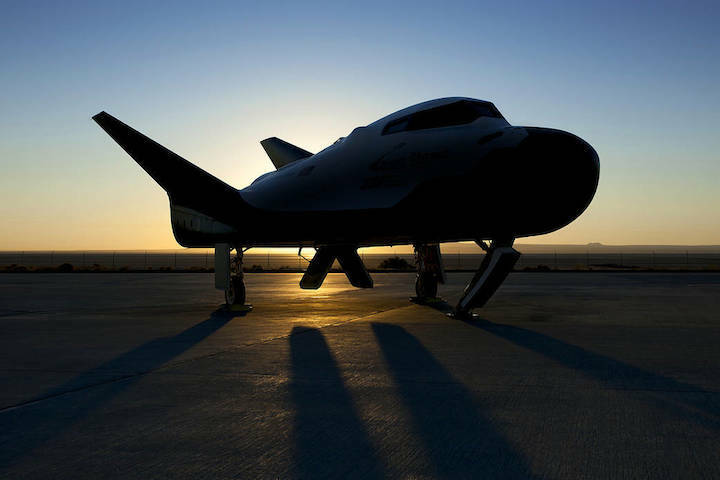 LOUISVILLE – Sierra Nevada has NASA’s okay for its Dream Chaser spacecraft’s first mission. NASA issued what’s called an Authority to Proceed this week, setting Dream Chaser's first launch window for late 2020. Sierra Nevada will build the spaceship in Louisville, where concepts and dreams are turning into deadlines. Dream Chaser's first mission will be to resupply the International Space Station. For Sierra Nevada, the goal will be to prove the reliability of what engineers in Colorado have been working on for years. The unmanned cargo version of the Dream Chaser will not have any windows. Dream Chaser will be the only vehicle flying to and from the ISS that has wings and lands on a runway like an airplane. It’s a gentle landing compared to other spacecraft used today. The Dream Chaser - manned version - can carry up to 7 people. 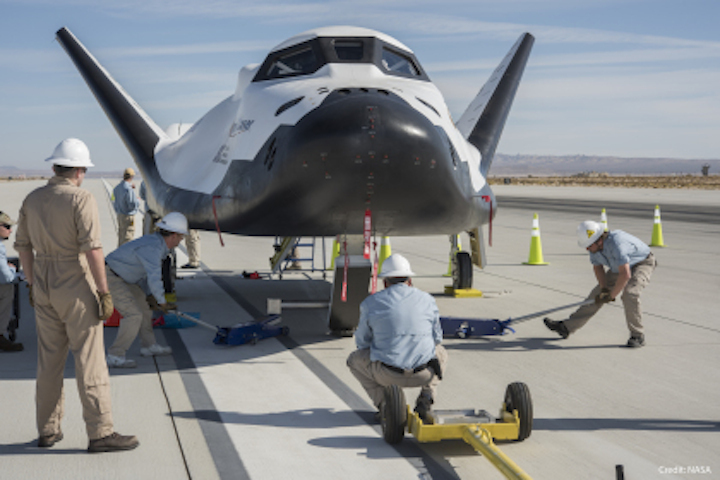 Sierra Nevada said each Dream Chaser will be able to fly at least 15 missions. And it can land on any commercial runway, anywhere in the world. The cargo-only version has no windows and includes a cargo module on the tail end of the vehicle. If NASA approves manned missions for Dream Chaser, the spacecraft could carry up to seven people. For now, just getting to launch day at the Kennedy Space Center in Florida would be a dream come true. “I think to actually see our vehicle fly will be just an unbelievable experience," Benzini said.